Valuing and deciding how much equity to give away of a company that you’ve, no doubt, put your heart and soul into is always going to be a gnarly issue. Unfortunately there is no single answer but there are a few things that can help you to navigate this notoriously tricky territory. What percentage of the company should I give away? In nearly all cases, the answer is ‘it depends,’ which, let’s be honest, is as useful as a chocolate teapot. With this in mind, it’s a good idea to set out what the ‘depends’ are. Start with how much of your company you want to give away, and work backwards. However, raising is incredibly hard, so it’s vital you understand how much you need to hit your KPIs, what would be helpful in terms of a buffer, and that you’re realistic about the deliverables and managing investor expectations. The reason for a 12-18 month runway is that realistically you’ll need to be on the fundraising trail six months before you’ll have new money in the bank, and you’ll need to show growth between now and then to get new investors interested. Any shorter than 12 months runway and it’s going to be hard to hit key milestones or show any real traction which means you are going to be unable to justify your next round valuation. It’s called a runway for a reason – if you don’t have liftoff before you reach the end, things will come to a sudden stop! As much as Dragons’ Den makes for great TV, here in the real world, high growth investment doesn’t happen like that. 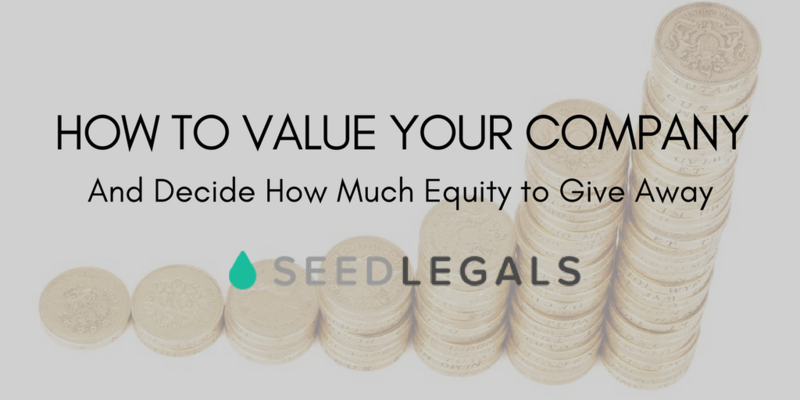 The general rule of thumb for angel/seed stage rounds is that founders should give away somewhere between 16 – 25% of the equity in the company. These parameters weren’t plucked out of thin air, they’re based on what an early equity investor is looking for in terms of return. You see it’s all about the investor really. They are placing bets on you being awesome with the clear knowledge that most of you won’t be, resulting in zero return for them. They are exposed to a high-risk/high potential scenario, hence will likely demand a juicy percentage of your startup equity, which if you think about it, seems fair. Instead of raising a single larger amount in one go which would carry you for approximately 12 – 18 months, an increasing number of companies are opting for a series of smaller raises giving away somewhere in the region of 2% – 6% equity per raise over a shorter period of time. Of course, giving away too much equity is also a big concern. However, tech innovation can and has changed all of this. There are now new solutions like seedlegals.com that make cap table management and exit scenario modelling easy. As to the time commitment of closing a round or an extension to an existing round, well that now depends on how quickly you can click a button, not how quickly you can find a lawyer. Whether you start from the raise amount or the percentage equity you want to give away, all roads will eventually lead you to valuation. Now we are not talking about fair market valuation here i.e. the amount someone would give you if they came and knocked on your door right now and offered to buy the company. The valuation we are talking about is a crazy number, a nuclear number, a number which bears no correlation to what actually exists on paper. This number’s sole purpose is to be added into a formula so that the equity percentage which you want to give away, or alternatively, the equity percentage your investor is asking for, can be calculated. You pitch us a number – if you’re ballsy enough and can justify that valuation based on your product vision, and you and your team’s ability to deliver it, great, we’re in! The biggest determinant of your startup’s value are the market forces of the industry and sector in which it plays, which include the balance (or imbalance) between demand and supply of money, the recency and size of recent exits, the willingness for an investor to pay a premium to get into a deal, and the level of desperation of the entrepreneur looking for money. Analysis of UK deal data reveals distinct funding patterns that highlights staged valuation bands. StageValuation Idea£300K-£500KYou’re looking to raise £50K to £100K to get your idea off the ground. New innovation means the legals can be sorted for as little as £750, just add investors and you’re good to go.Prototype£300K-£750KYou’ve spent six months refining the idea, doing user testing, building a working prototype. You’re somewhere between Idea and Launch, with a valuation to match.Launch£500K-£1MYou’ve spent a year building the product with your co-founders, probably not paying yourselves a salary, plus you’ve invested £50K of your own money/time in the project. You’re close to launch, you now want to raise money for that last mile of product development and for marketing.Traction£1M-£2MYou’ve launched (congrats!) and you’re seeing good signs of early traction, enough to get investors excited. You have revenue plans, but nothing to show yet.Revenue£1M-£3MUnlike Silicon Valley where the vision of being a unicorn is often enough to get investors interested, UK investors like to see revenue, or at least the promise of imminent revenue. Conservative or sensible? Probably both, but either way if you’re not showing revenue getting funding in the UK beyond Prototype stage is going to be tough. Once you have the some revenue though, along with a plan to scale, you’re on a roll.Scale£3M+To get to this point, you need to have figured out product/market fit, proof of repeatable business and large market demand provable by data, a clear path to scale and new business acquisition, and have identified customer acquisition cost and customer lifetime value. You’ll know when you get there. But note that with that valuation (and amount raised) you’ll have moved firmly from angel investor to venture capital territory which comes with a great deal more investor and reporting obligations, complex fundraising terms, governance and expectations. Something to note before hopping to the top table too soon. Cautionary note – Silicon Valley numbers will often be much higher so don’t be tempted to use those for the UK or investors will think you’ve been drinking too much Silicon Valley Kool-Aid. Ultimately, the investor will have the final say but the future is bright for the start-up market, boosted as it is by tech innovation which is simplifying the funding and admin process from the get- go. The hope is that by removing a lot of the uncertainty currently surrounding admin costs, more businesses will be able to focus on the end goal; making a startup idea a successful reality. Meet Anthony Rose of SeedLegals and other business service providers, as well as a broad spectrum of funders and other entrepreneurs, at the Business Funding Show 2018, an all-day event on 22nd February at London’s East Wintergarden. Learn more and secure your early bird ticket at bfsexpo.com.